The Central Nevada Test Area (CNTA) is in the Hot Creek Valley of south-central Nevada, approximately 70 miles northeast of Tonopah. The CNTA consists of three parcels totaling 2,560 acres. The parcels are spaced approximately 3 miles apart along a roughly north-south line. The total acreage is currently withdrawn from all forms of appropriation associated with mining laws and leasing. The U.S. Atomic Energy Commission, now the U.S. Department of Energy (DOE), acquired the CNTA in the early 1960s to develop alternative sites to the Nevada Test Site, now the Nevada National Security Site, for underground nuclear testing. Three emplacement boreholes, UC-1, UC-3 and UC-4, were drilled on the parcels at the CNTA for underground nuclear testing. The initial underground nuclear test, Faultless, was conducted in borehole UC-1 at a depth of 3,199 feet below ground surface on Jan. 19, 1968. The yield of the Faultless test was estimated to be in the 1 megaton range, 67 times more powerful than the bomb used at Hiroshima. 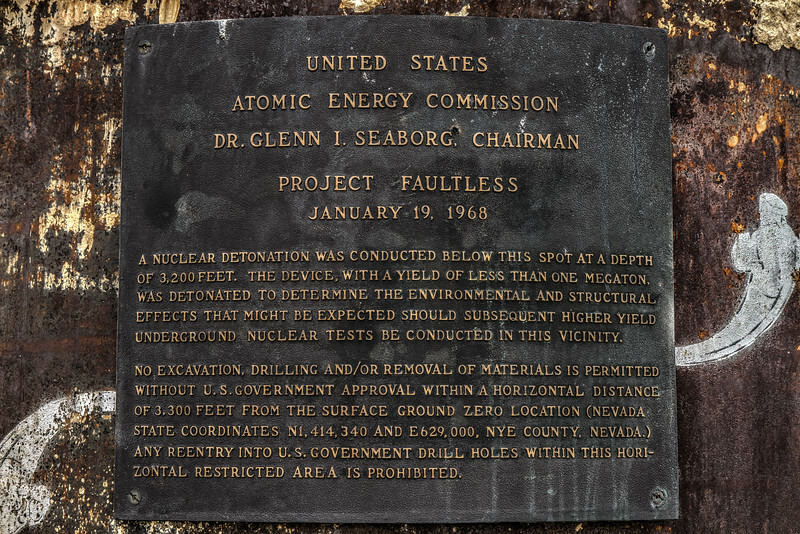 Its purpose was to evaluate the environmental and structural effects that might be expected if subsequent, higher-yield underground nuclear tests were conducted in this vicinity. The test resulted in a down-dropped fault block visible at land surface. In addition, seismic results supported the indication that the site was not favorable for larger detonations. The nuclear detonation created a cavity with a radius of approximately 328 feet and ground swelled 15 feet up and the collapse created two parallel faults nearly a mile apart. The explosion ripped a trench 3,000 to 4,000 feet long, 15 to 100 feet wide, and 3 to 23 feet deep. The area around the test drops 12 to 14 feet, entrenching some 14 acres.